If your firm is looking to engage in federal contracting an important marketing avenue not to miss is Federal IDIQ Contracts. What is and IDIQ Contract – Indefinite Delivery, Indefinite Quantity Contracts; If your firm is selected to be on an IDIQ contract your firm is then one of the only options for federal orders/agencies using this contracting vehicle. Your firm’s IDIQ contract will contain a list with your standardized pricing. Just because your firm is placed on an IDIQ contract does not mean you will receive orders. Your firm may or may not receive an order from the contract as there is still competition on the contract itself, but the odds are good that you will! In effect the IDIQ contract simply reduces the federal buyer’s options to a group of small qualified vendors. This reduced list of vendors provides more standardization and uniformity to many procurements in both broad and specialized areas. So in other words some portion of this contract will be given to the 8(a) certified firms as well as other SBA/VA Certification holders that took the initiative and effort of getting placed on the IDIQ. Those that did not do are unable to receive contracting dollars from the IDIQ. In many cases the IDIQs overall value is in the billions of dollars and under a handful of 8(a) firms were even aware of the IDIQs existence so competition can be very low. An example of a portion of an IDIQ carved out specifically for 8(a) firms is the following recent contract for Federal Janitorial Services in the State of Florida. Below is the list of locations that were reserved for 8(a) certified firms. 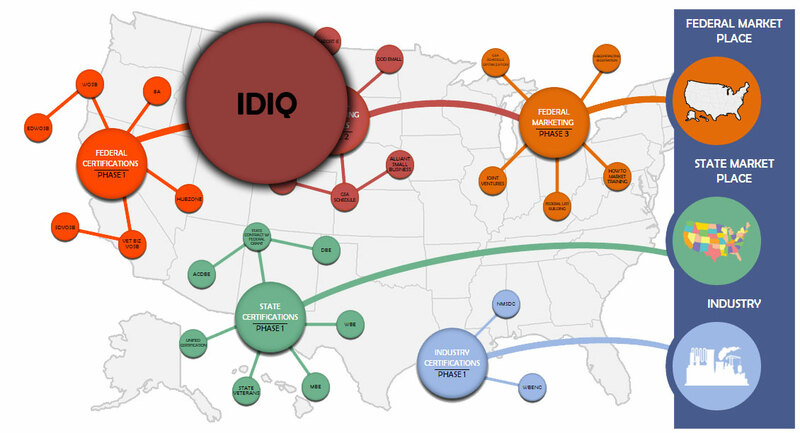 IDIQ Contracts should be part of any firm’s federal marketing strategy. 8(a) firms have only 9 years of eligibility and therefore it is critical to get into the IDIQ arena early as these contracts are critical to maximize a firms contract awards while in the 8(a) program.